According to latest information by whistleblower Edward Snowden, the US National Security Agency (NSA) has hacked into an important submarine data cable that connects Southeast Asia with Europe, German magazine Der Spiegel wrote on December 29. A leaked classified document describes that the NSA was tapping the Sea-Me-We 4 cable, an 18,800-kilometer long fibre optic cable that runs from Singapore, Malaysia and Thailand around India and the Arabian Pensinula along the Red Sea to North Africa and eventually to France in Europe. The cable is the primary Internet backbone between the regions. 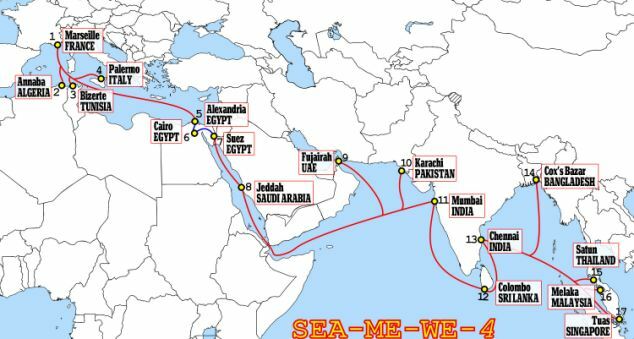 Reportedly, the NSA has hacked via the website www.seamewe4.net into the servers of the cable operating company, a consortium of 16 telecom firms of countries along the route of the cable. That way, it gained access to data on technical infrastructure and “important parts” of the cable network and the transmitted information. Earlier this year, media reports indicated that Western and Asian intelligence were tapping into the cable as well.